A fourth-year Edinburgh high-school pupil has been announced as the winner of the Scottish Leaders Innovation award, a national competition run by Primary Engineer, a charity working to promote engineering skills and careers with young people, and one which Clyde Marine Training has been proud to partner with throughout the year. 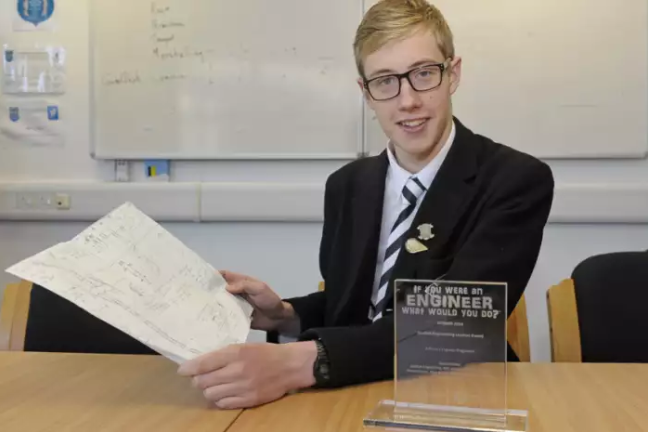 Douglas Macartney, 15, is a pupil at Edinburgh’s Royal High, won for his invention of a flatpack wind turbine that could revolutionise life for refugees and victims of natural disasters, and was one of 15 winners out of 11,000 entries. Douglas came up with the idea of the modular turbine after being inspired by Swedish furniture giant Ikea’s solar-powered flatpack refugee shelter that won the London Design Museum’s design of the year award in 2016. After brainstorming who else in the world could be helped by his award-winning idea, Douglas came up with supplying the aluminium and composite material turbines to remote areas that have been affected by natural disasters. Now Douglas’s wind turbine has been chosen by a team of engineering masters students at Glasgow Caledonian University to turn the idea into a working prototype that they hope will one day be mass-produced. Euan Howieson, team leader of the university students who will be making the prototype, had high praise for the teenager. He said: “Douglas’s design was easily the best one. It was laid out perfectly and it was clear that he had done his research. It also contributes to the common good. “If I was like that at his age I would be a much better engineer today.” Douglas’s second-year chemistry teacher and Royal High’s STEM (science, technology, engineering and mathematics) co-ordinator Phil Wootton said: “I’m absolutely delighted for him and very proud.